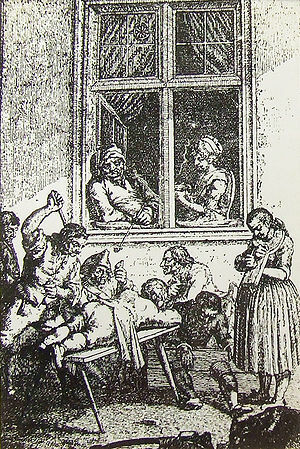 Engraving by Johann Michael Mettenleiter (1765–1853) showing three punishment methods common in Europe in the 17th century: corporal punishment, the stocks and the shrew's fiddle. Punishment is the practice of imposing something unpleasant on a wrongdoer. It puts the wrongdoer in a state of physical, emotional, financial or otherwise discomfort. Punishments are used wherever a person or institution has authority to watch over other people's behavior and enforce rules and regulations, for example in jurisdiction, in the military, in parenting and in educational institutions. A punishment is generally given in reaction to an act of unacceptable (forbidden) behavior. Sometimes punishments are given after an inspection showed a major breach of an order or rule. The Latin proverb "quae nocent, docent" (what pains us, trains us) expresses the idea that a painful experience is teaching. The severity of punishment imposed, in relation to the offense, can vary greatly depending on the person in authority. This is expressed by the terms lenience and strictness. A person found guilty and sentenced to be punished is called a delinquent. A person who is ready to accept punishment willingly is called a penitent. no supper, no dessert, etc. At least three aims of punishment can be identified: revenge, repentance and deterrence. Revenge or vengeance consists of retaliation in response to perceived wrongdoing. Revenge is a hotly contested ethical issue in the post-industrial society. Repentance is the feeling and act in which one recognizes and tries to right a wrong, and gain forgiveness from someone that they wronged. Deterrence is a means of controlling a person's behavior through fear of punishment.